The Clinical Research Manager, with over 3 years of clinical research experience in asthma, allergy and immunology. Joined GSCR in 2015. Currently working on phase 2 and 3 milk, hereditary angioedema, and primary immunodeficiency clinical trials. Oversees regulatory affairs, contracts, and budgeting. A certified clinical research professional, who graduated from University of Guelph with a Bachelors in Biological Science. Joined GSCR in February 2016. Currently working on phase 2 and 3 peanut, urticaria, primary immunodeficiency, asthma, dustmite, timothy grass, atopic dermatitis, and systemic mastocytosis clinical trials. Has nearly 3 years of clinical research experience in allergy and clinical immunlogy. Joined GSCR in July 2018. Currently working on phase 2 and 3 hereditary angioedema, milk allergy, peanut allergy, chronic spontaneous urticaria, and timothy grass clinical trials. 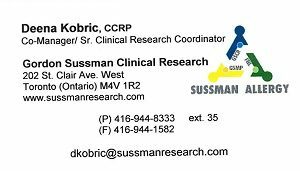 A clinical research coordinator who graduated from the Humber clinical research program. Joined GSCR in October 2018. Currently working on phase 2 and 3 asthma, atopic dermatitis, and urticaria clinical trials. Graduated from York University with a Bachelors of Science degree. This aspiring physician initially joined GSCR in July 2017 as a volunteer before being promoted to Research Assistant in January 2018. 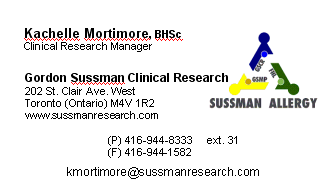 Currently assists in a wide variety of activities in clinical research.